... blueberry pierogi, which were my ab...The borscht was to die for and varied selection of homemade perogies was awes...The Perogies and schnitzel were excellent. Polish Bistro is casual lunch and dinner restaurant open daily from Monday to Saturday from 11:30 am to 8:00 pm. 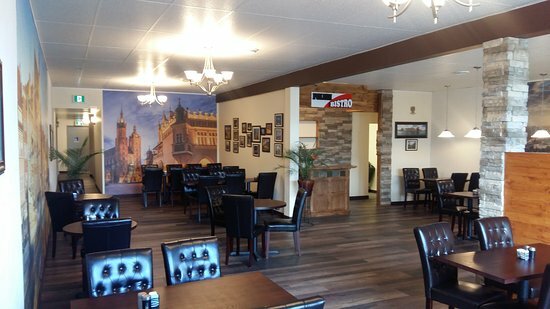 At Polish Bistro you can enjoy Polish traditional meals offered in home cooked style. From 6 types of pierogies, cabbage rolls and borsch to pork chops, chicken breast wrapped in bacon, crepes and Polish sausages you can find number of mouth watering meals resembling those cooked by our grandmas. Everything is made fresh on a daily base. Dropped in for a late lunch the other day....sampled the 5 different perogies small order and a Polish beer I'd never tried. What a nice lunch! Super fresh perogies. Best I've had in years, although I'm no expert on the mater. the food here is great and they have a lunch special which is great to order as you get a little of everything as well ...please GO!!! First time visitor and will definitely return. Traditional Polish dishes. The mixed perogies plate did not disappoint, each bite took me back to my time & visits to Poland. Borscht soup is delicious. Nice atmosphere and friendly service. Get quick answers from Polish Bistro staff and past visitors. Yes... As they are new the menu is ample but still narrow... I understand they will be expanding it in the next few weeks..